A few weeks ago my family and I were at the feria doing our usual shopping. That week meat coconuts were selling everywhere. Yes, there are many different kinds of coconuts, but not all have thick meat that is great for making milk, oil and flakes. These particular coconuts are harvested once a month, so if you want it… you gotta buy as many as you can to last through next few weeks before the next batch will be harvested. So I bought about 2 or 3 coconuts for my first try in making coconut flakes. I originally bought them to make milk, but changed my mind after I ate some of the meat. It was too good! 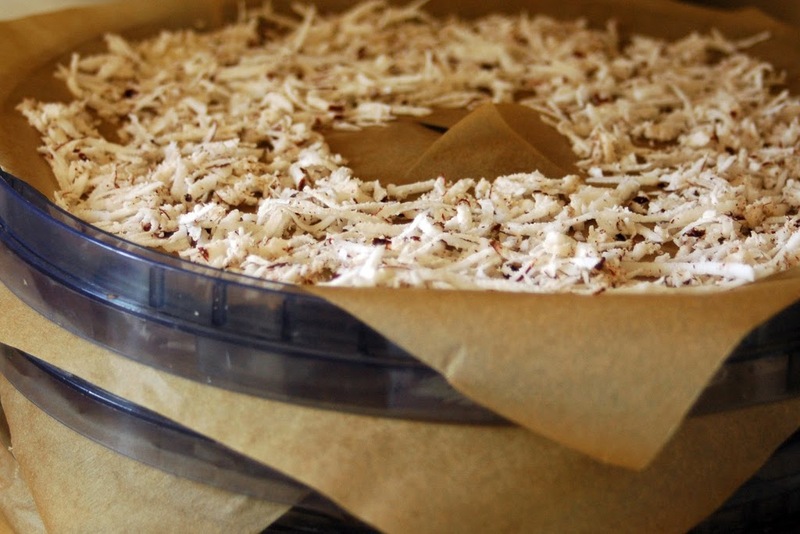 It was pretty simple to dehydrate the coconut meat, but I had to keep my eye on them so that they would not dry out too much. First, my dad helped me crack open the coconuts. You can do that by beating it (turning it in a circle) on a hard edge. You do that till the coconut water starts leaking out OR you can take a screw driver and hammer, poke holes in the “eyes” to get the water out. Either way, make sure you have a cup ready to drink it! So good! After all the water it out, crack it open. After you’ve got them open. You have to dig out the meat and that’s the hardest part. If your coconuts are fresh, sometimes it won’t come out easily. You can put them in the fridge to dry out a little, but it will lose some of its flavor. If I can’t dig it out with a spoon or knife, then I BEAT it out! I take a hammer and turn the coconut over (inside facing down) and beat it till the shell and meat break apart. Next, I put together my food processor to shred the coconuts. One coconut gives me about 2-3 cups and one coconut can cost anywhere from 250 colones to 400 colones (roughly about 50 to 75 cents). So, I’m getting more fresh coconut flakes for less than what it is at the store. Ooo, the joys of being frugal! 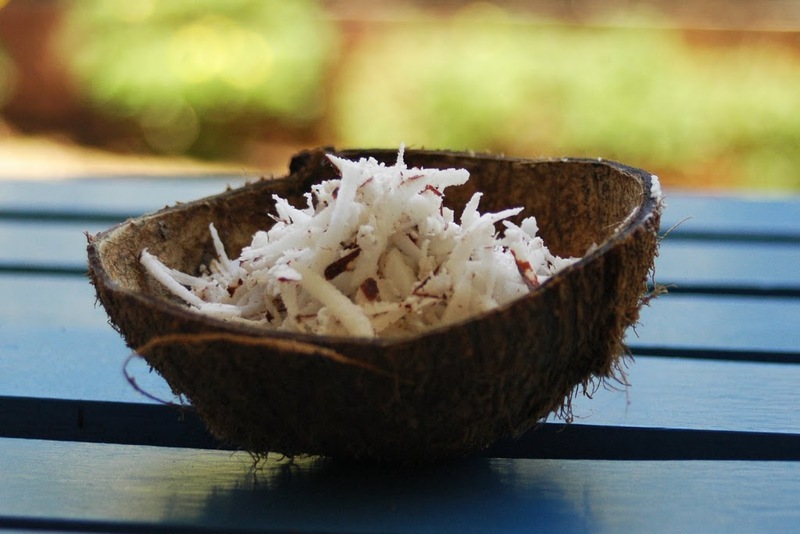 Freshly shredded coconut in a coconut bowl. So yummy! It tastes great, fresh, with a fruit salad. 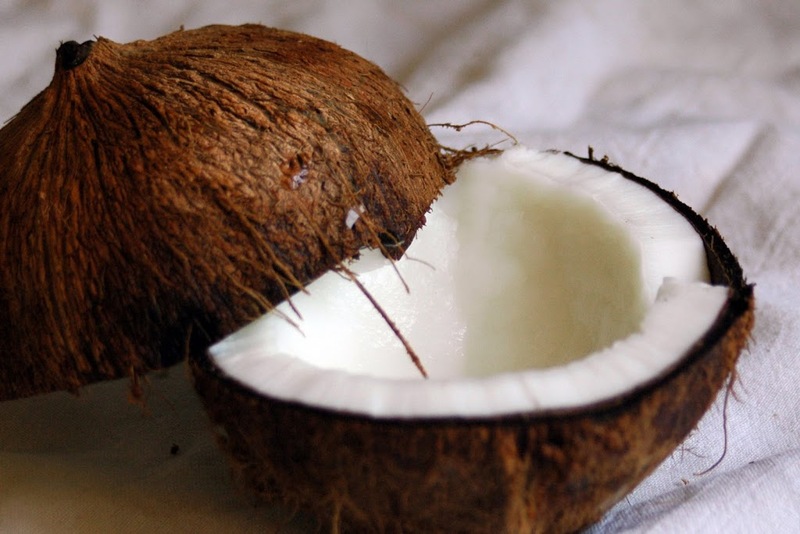 I am planning to try making coconut ice cream using fresh coconut meat in the near future. Hmmm, can’t wait! So yummy! Now I get my dehydrator and brown parchment paper (which I found here in Costa Rica!) out. I cut out the parchment paper to fit the trays and cut the center for the air to circulate better. Make sure you spread it out enough to dry evenly. I found that I had to rotate the trays because the ones on the bottom were drying faster than the ones at the top. You’ll have to check on it regularly and move the meat around a little. When a tray of meat is done, simply take it out and put it in a sealed glass jar. It will last for a while as long as air doesn’t leak in to stale it. There you go! 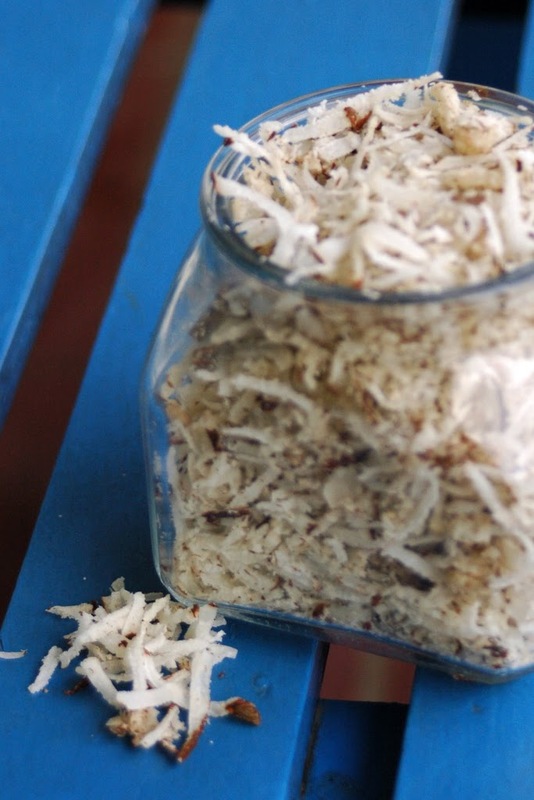 Your very own homemade, fresh, yummy, easy and frugal coconut flakes! 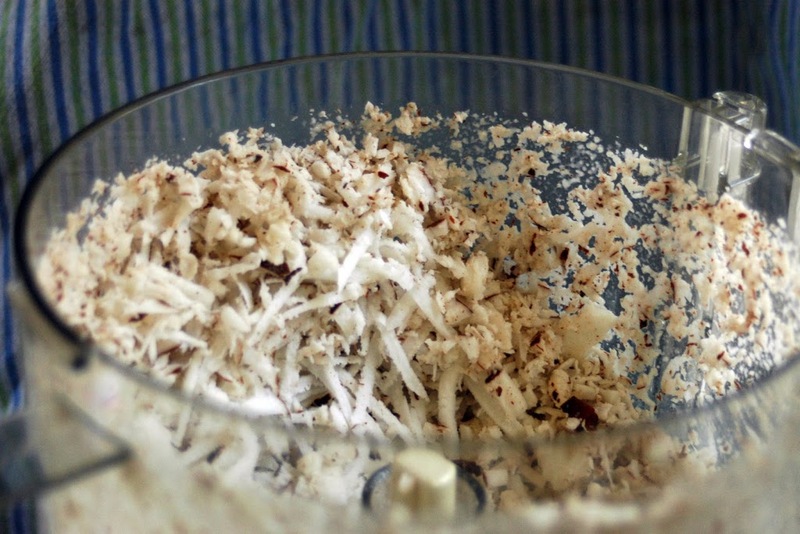 first time i heard of using food processor to shred the coconut meat. we use a metal with small sharp edges on one side. this is attached to a chair so you can sit will shredding the coconut meat on this. 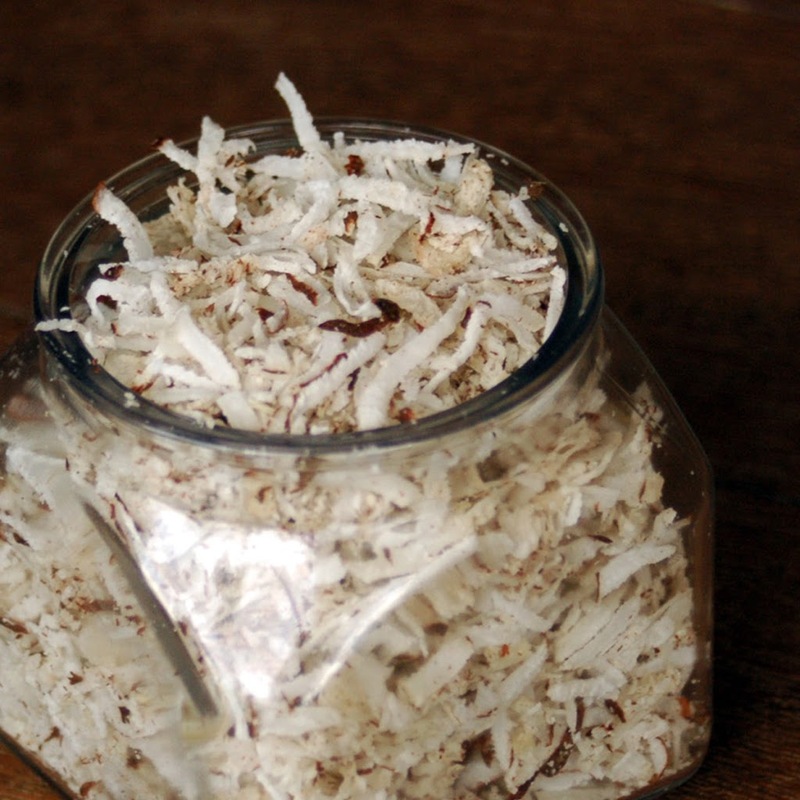 push the coconut meat in downward motion and the shredded meat will fall down in a container below.